Despite the frigid temperatures, Asia Week New York—the ten-day Asian art extravaganza—which concluded on March 18, 2017 roared to a close with a record-breaking $423,772,742 in combined sales which included the fifty galleries and five auction houses: Bonhams, Christie’s, Doyle, iGavel, and Sotheby’s. “With the influx of Chinese buyers, museum curators and collectors, Asia Week New York ended on an upbeat note with record-breaking sales in all categories,” said Lark Mason, chairman of Asia Week New York. “An unprecedented 50 galleries participated with exhibitions spanning five centuries and auction house totals skyrocketed like never before. 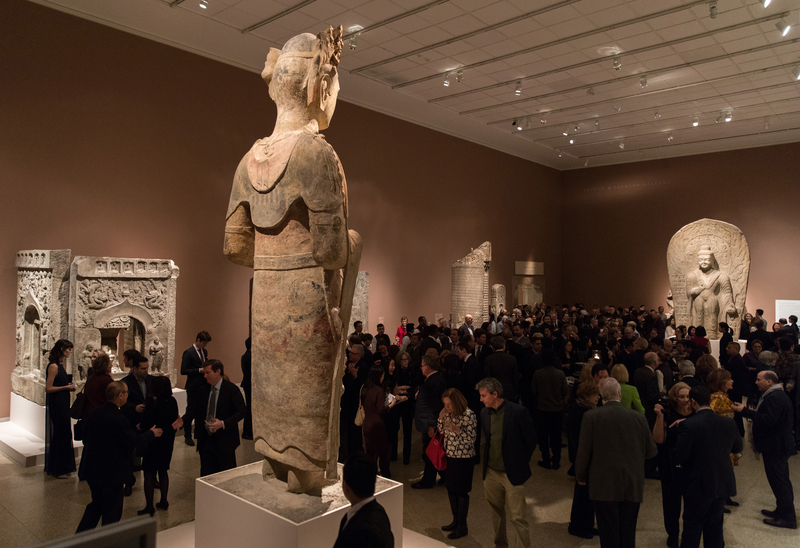 All in all, Asia Week New York was a huge success!” Asia Week New York is always a draw for international museum curators on the look out for treasures for their museums, and this year was no different. They represented museums such as the Asian Art Museum in San Francisco, the Art Institute of Chicago, the Saint Louis Art Museum, the Minneapolis Institute of Art, the Museum of Fine Arts, Boston, The Brooklyn Museum, The Metropolitan Museum of Art, the Newark Museum, the Phoenix Art Museum, the San Antonio Art Museum, The Los Angeles County Museum of Art, the Herbert F. Johnson Museum at Cornell University, the Harvard University Art Museums, the Indianapolis Art Museum, the Yale University Art Gallery, the Portland Art Museum, the Mead Art Museum at Amherst College, the Museum of the City of New York, the Nelson-Atkins Museum, the Philadelphia Museum, the Kimbell Art Museum, the Worcester Art Museum, the University of Michigan Museum, the Cleveland Museum, the Crow Collection in Dallas, the Virginia Museum of Art, The Berkeley Art Museum, the Princeton Art Museum, the Jordan Schnitzer Art Museum, the Norton Museum of Art, Asia Society Museum, Ackland Art Museum, The China Institute, The Toledo Museum, The Korean Cultural Center, the Freer and Sackler Galleries, the Smart Museum and from abroad the British Museum, The Hong Kong Museum of Art, the Royal Ontario Museum, and the Asian Civilisations Museum in Singapore. Brendan Lynch of the London-based gallery Oliver Forge & Brendan Lynch said that they had a steady steam of visitors with buoyant sales from collectors and museums. One of the objects snapped up was Krishna and Balarama conversing with Nanda on a terrace, circa 1765. Walter Arader of Walter Arader Himalayan Art in New York was pleased with the week having received many museums and private collectors both new and old. Mr. Arader reported that his prized work of art, Padmapani Lokeshvara, a 16th century gilt bronze, was snapped up by a private collector.